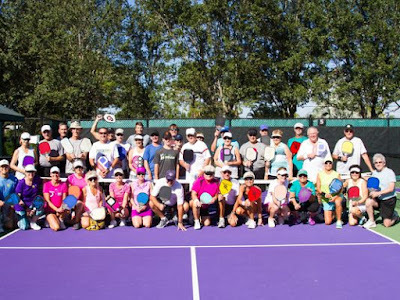 The Pelican Landing community in Bonita Springs hosted its inaugural holiday "Pickle Jar Tourney" on Dec. 29. All community pickleball players in town and their visiting families were invited to play. Nate Kemler, a USAPA member, organized it all. There were 40 participants using six courts, with many other family members cheering on the sidelines. First place team each won "The Jar", a trophy made from a jar of pickles, and the second place team won coupons for pickles.